I first encountered Henning Mankell through his Inspector Kurt Wallander crime fiction. 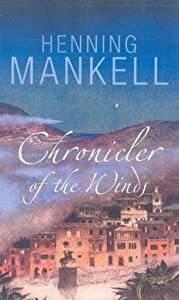 Chronicler of the Winds, however, a fantasy that reminds me of Ben Okri‘s best works, is subtitled “A Novel of Africa.” I am always drawn to fictions in which the magical interrupts the prosaic and swerves between the two. Mankell weaves stories of extreme violence and pain into a narrative that is simultaneously nostalgic (in the best sense of that word; an ache for things that might have been) and emphatically optimistic. Fiction changes the world.